At HAI Group, we care about protecting your community. We have become aware of online rental housing scams targeted at Section 8 tenants, and we want to help them avoid becoming a victim. That’s why we’ve partnered with Affordable Housing Online to create a set of tools to share with tenants to generate awareness. In just a few short minutes, How to Prevent Housing Scams, will show tenants how to avoid rental housing scams. Click here for instructions on how to embed this video onto your organization’s website to alert those seeking apartments in your area. Download our poster and display it in waiting areas or places where new applicants may view it to create awareness and offer useful tips. 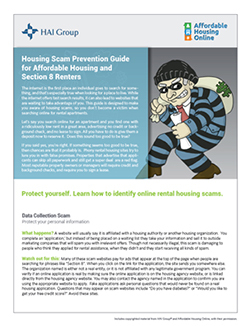 Let your residents know how they can avoid becoming a victim of a rental housing scam. 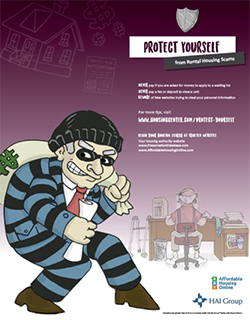 Download the Housing Scam Prevention Guide for Affordable Housing. Some organizations have started to post alerts and useful tips on their website. Click here to see an example of how The Greenville Housing Authority is taking action. It’s not just renters who are vulnerable to fraud—homeowners who are facing foreclosure are also being targeted by loan modification and foreclosure rescue scams. Learn about the most common scams from the Office of the Inspector General (OIG) Rental Scam Alert, found here.